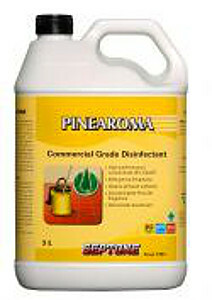 Septone Pinearoma Commercial grade Disinfectant is a quaternary ammonium compound disinfectant cleaner, effective against a wide range of microorganisms including bacteria (both gram-positive and gram-negative), fungi and yeasts. And because Pinearoma is so efficient at killing these organisms which cause malodours, it is an effective deodoriser as well. Pinearoma contains only the highest quality pine oils to provide a pleasant residual pine tree masking fragrance which aids in the deodorising of malodours.